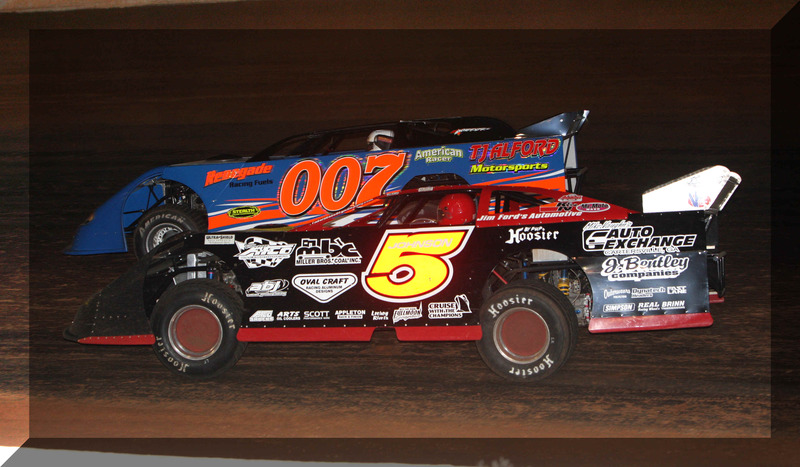 CHATTANOOGA, TN (2-20-07) -- Two-time former Dirt Track World Champion, Ronnie Johnson of Chattanooga, TN, is planning on making his return to racing this coming weekend during the 8th Annual "BAMA BASH" at the Green Valley Speedway in Gadsden, AL. Johnson has reported from his North Chattanooga home, that things are pretty much back to normal, and that despite the almost three months of recooperating and focusing on prep for the 2007 season, he'll be back to his ole ways of being close to the last one, pulling into the facility on raceday. In 2006 RJ took home a top 5 finish with the familiar black and red #5 "Miller Bros. Coal Inc, Starette Trucking, Mike Vaughn’s Auto Exchange"
sponsored, MasterSbilt chassis / Race Engine Design, Pontiac Gran Prix racecar solidly with a third place run. Georgia dirt-track star "CAT-DADDY"
Clint Smith took the "BAMA BASH" victory in 2006, flanked by local racer Robert Gant. Johnson was also a regular on the STORMPAY.COM Crate Late Model series in the 2006 season, tallying a ninth place overall finish in the points standings. Johnson was injured back in November, down in South Alabama at the East Alabama Motor Speedway in Phenix City, racing for the $30,000 top prize of the "NATIONAL 100" that Chattanooga neighbor Dale McDowell of nearby Chickamagua, GA collected. Johnson's broken right arm seems to be 100% as his rehabillitaion doctor has cleared him to compete. More information can be accessed regarding the 2007 "BAMA BASH" at the tracks web-site www.greenvalleyspeedway.com/.